Release Date: February 2nd by Universal Pictures. The Cast: Diane Keaton, Mandy Moore, Gabriel Macht, Tom Everett Scott, Lauren Graham, Piper Perabo, Stephen Collins. BASIC PREMISE: Daphne (Keaton) secretly sets her daughter, Milly (Moore), up with Jason (Scott). 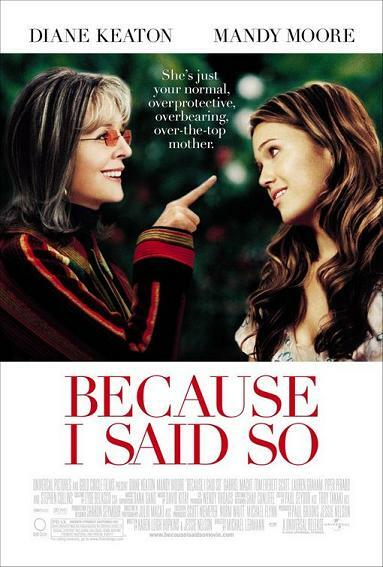 ENTERTAINMENT VALUE: As Daphne in Because I Said So, Diane Keaton essentially plays the same overbearing, control-freak mom she played in the equally vapid film, The Family Stone. She decides to place an ad for in online dating service to look for the best suitor for her daughter, Millie. What follows is a painfully unfunny, contrived mess of a plot with an ending projected from the very first act. Since when is a balloon stuck to somebody’s pants considered to be funny? Or being hit in the face by a cake? From the start, it’s not quite clear why Daphne chooses Jason as a perfect suitor other than because he’s wealthy. Millie meets a less wealthy guy, Johnny (Macht), on her own, but they don’t really have much chemistry. Mandy Moore should stick to singing rather than trying to act given that she fails to be remotely believable as Daphne’s daughter. Co-screenwriters Karen Leigh Hopkins and Jessie Nelson don’t include one organic, believable scene that doesn’t include some awkward dialogue, like Daphne and Millie openly discussing orgasms and Millie actually demonstrating what happens when she has one. A subplot involving Maggie (Graham), another of Daphne’s crazy daughters, doesn’t serve much of a purpose nor does Maggie seem like a real therapist. All-of-a-sudden, Daphne makes out with Johnny’s father (Collins) after just meeting him a few minutes earlier. The plot becomes increasingly silly with more vomit-inducing scenes while the characters get more annoying. It’s difficult to even call this a romantic comedy because there’s no real romance or comedy to be found here. Where is John Hughes when you need him? At a running time of 102 minutes, Because I Said So overstays its welcome by, well, 102 minutes. INSULT TO YOUR INTELLIGENCE: Vapid, contrived and painfully unfunny. IN A NUTSHELL: A vapid and painfully contrived excuse for a romantic comedy with no real romance or comedy. RECOMMENDED WAY TO WATCH: Never.